Blesilda Gotingco. New Zealand is so unsafe for women. The speed with which police arrested a 27 year old man for the murder of North Shore woman Blesilda Gotingco can only mean that he was already known to them. It is highly likely this man has committed other crimes of violence against women, and there’s a strong chance he is already on parole for one of them. 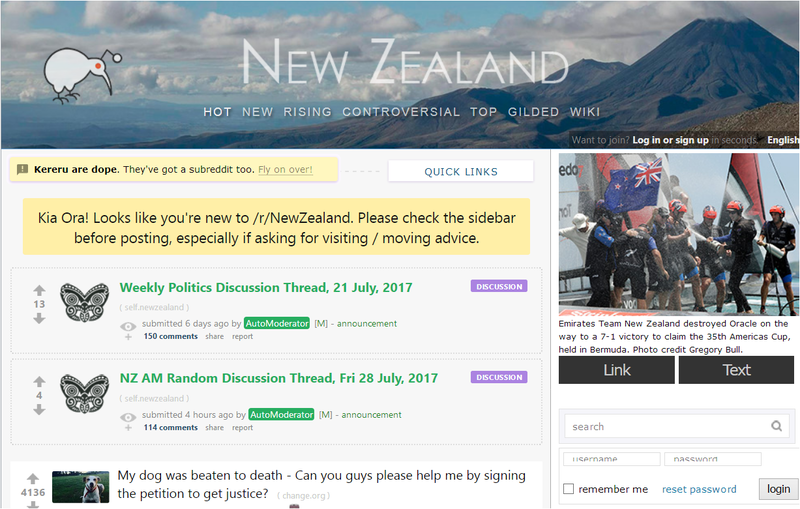 Update 29 May 2014: A message was left on E2NZ.org saying the arrested man had been released from detention for a serious crime and was wearing an ankle bracelet. 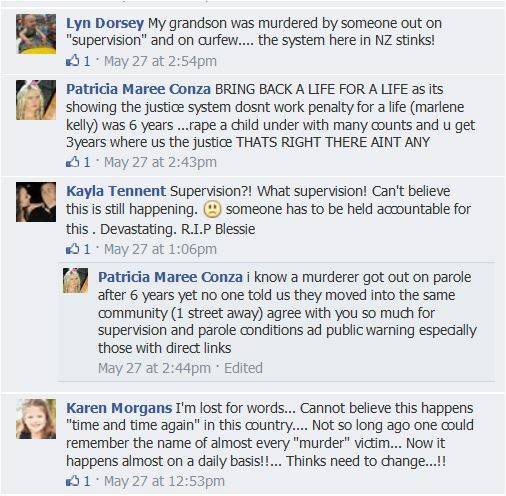 Update 30 May 2014: Twitter is saying that the accused has been named on the NZ’s Sensible Sentencing Trust’s Facebook. Update 9 June. 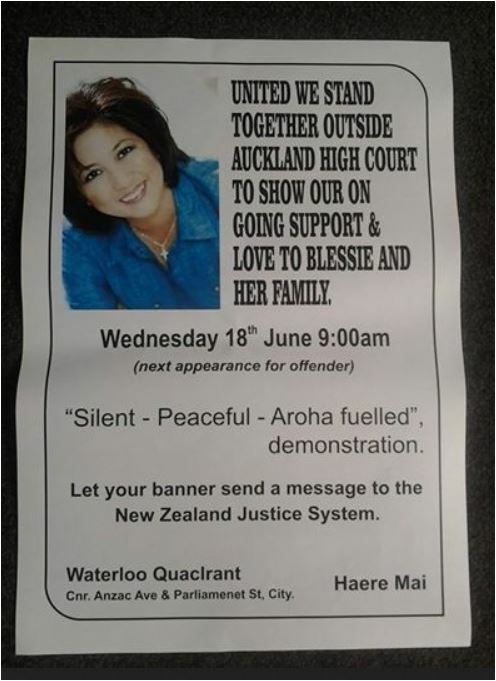 A march protesting against NZ’s ineffective criminal justice system is planned for Wednesday 18 June. This is called a hui. When it is over New Zealanders will go back to their complacency until the next woman is killed/raped/tortured by a dangerous ex-con. Update 18 June. The accused appeared in court today and had to be taken back to the cells when he became abusive. The trial has been scheduled for a 3 week block in March 2015. Meanwhile the Sensible Sentencing Trust (staunch advocates for justice and victim’s rights) got a visit, and a warning, from the NZ police. Update 19 June. People are understandably perplexed by the accused given continuing name suppression, and the trial being delayed until next year, saying “justice delayed is justice denied“. 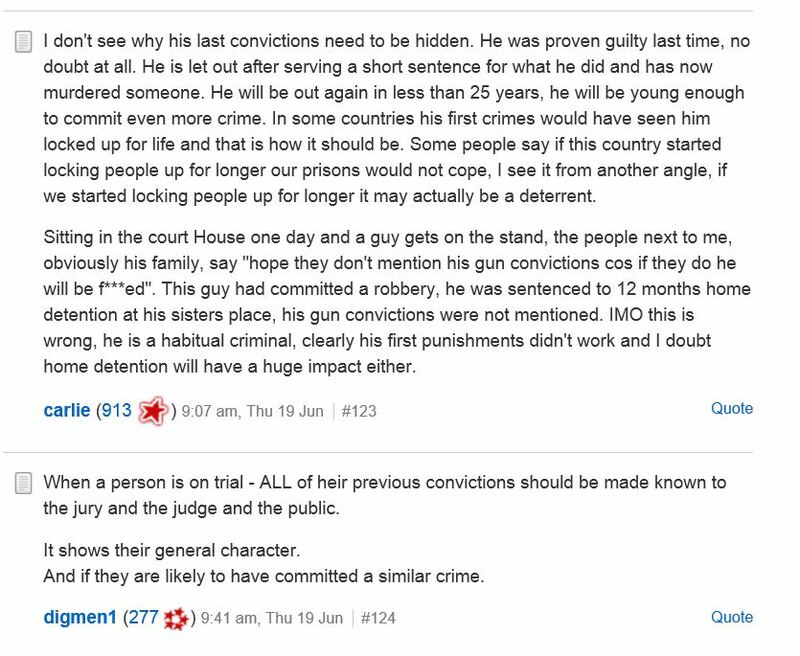 These comments appeared on the Trade Me forum today, there is obviously a lot of cynicism about the effectiveness of New Zealand’s criminal justice system. He appeared in the North Shore District Court last month charged with the first breach for hosting a visitor overnight at his Parole Board-approved accommodation and pleaded guilty. He was sentenced to two months’ imprisonment. Blesilda, who was of a diminutive stature, was snatched off the street as she walked home from a Birkdale bus stop on Saturday evening. 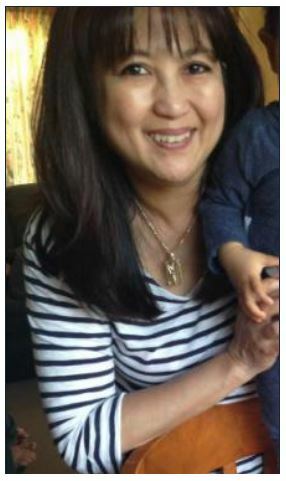 “A 27-year-old man has been charged with the murder of Auckland woman Blessie Gotingco after a woman’s body was found in an Auckland cemetery. He is expected to appear in the North Shore District Court either late this afternoon or tomorrow morning. On video link from Auckland, Justice Paul Heath said the Crown alleged that the murder took place in the course of another serious offence, namely a sexual offence. Sick and tired with offenders getting off lightly for their crimes? are NZ’s courts to blame? visit Judge the Judges – an initiative of the Sensible Sentencing Trust. This dreadful murder comes a month after another woman was raped and murdered by a parolee, who then went on to attack two young tourists leaving them for dead on the side of the road. 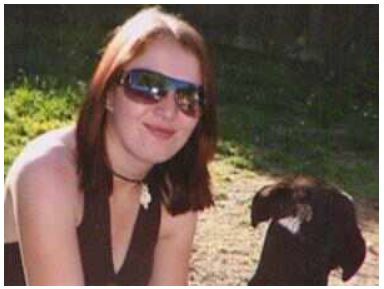 Young Amy Farrall (below) fell victim to Aaron Rhys McDonald, 38, who’d been released from prison just six months before he ended her life. again and again, it’s happened to other families too. Read more Terror spree suspect on parole and Amy Farrall murder accused pleads guilty. According to data complied by New Zealand’s Sensible Sentencing Trust, 43% of prisoners released on parole in NZ are re convicted within 24 months. Furthermore, bail is granted for 81% of charges for a violent offence. 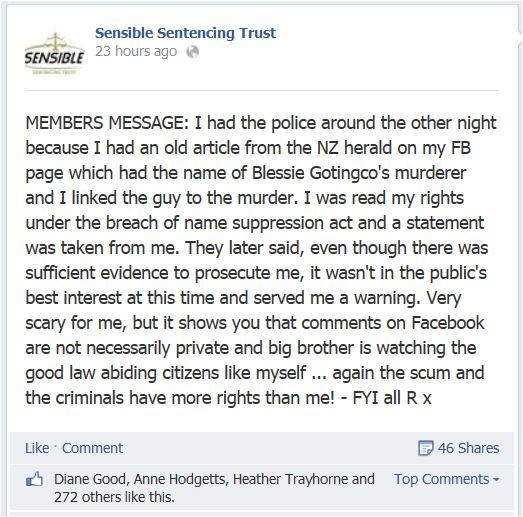 The Sensible Sentencing Trust have said Blessie Gotingco’s muder was a national disgrace, and entirely preventable. The trust’s website has published the stories of many NZ families ripped apart by violent criminals, failed by an ineffective justice system that is under-resourced and stretched past breaking point. It is a system biased towards the offender, with little regard for victims. It is strange today to hear the NZ press talk talk-up the “tight-knit community of Birkdale.” It wasn’t that tight on Saturday evening when not one single person responded to Blesilda’s terrified screams. A neighbour reported hearing frightened screams around 8pm followed by “the loud sound of a low slung car roaring off.” However, she did nothing and did not make a report to the police until an investigation into Mrs Gotingco’s disappearance had began. Blesilda’s death is another reminder of just how unsafe and heartless New Zealand has become, and how many violent and dangerous offenders are out of prison wandering the streets. Another Everyday Shooting, New Zealand’s Unsafe Streets. 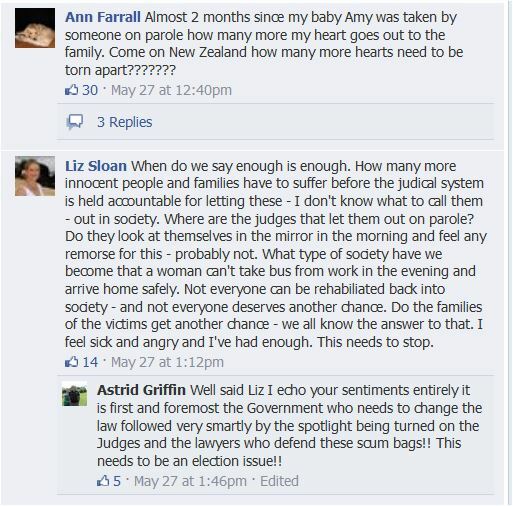 There is so much violent crime against women and children in NZ, it’s shameful. 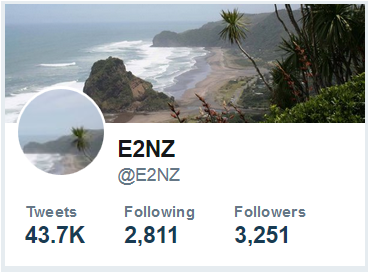 I’m a kiwi living in Los Angeles and it is not as bad here – we have 3 times NZ’s population in one city. I don’t get it. Can someone explain this to me? This criminal put in a no plea. Time to overhaul the system. No plea to jury…..guilty….no parole…..life means life. Plea to guilty and judge’s sentence 25 to life with non parole period of 20 years. Not until March next year for a jury to sit and look at this murderer. NZ can learn from US prison called ANGOLA. Maximum security. No prisoner leaves alive. Hard labour in the fields. Crims here have it way to cushy in prison. We are all still hurting, raw in our hearts for what happened to poor Blessie and her family. And, every other person in NZ, where there lives and familes lives have been robbed. The judicial / parole syetem has failed yet again, and continues to do so, letting perpetrators like Blessies killer back into the community, when the warning signs were very evident. It’s interesting to see, that this hideous creature, got name suppression again today – All they say, for him to have a fair trial….. I don’t care for one moment if he gets a fair trial or not, what he has done in the past, which will eventually come out, and what he did to Blessie is not fair. Nor is it fair for the tax payer to keep him in a prison for the next, so many, years. That money is so desperately needed in so many other sectors of society. I advocate capital punishment. A life for a life. Although in some ways, death by humane euthanising is to easy for these killers. Maybe they should die in the same way that they killed there victims, and experience the same incomprehendible fear and terror there victims must have gone through. Nz goverment should do somthng about it before its too late. Wy the fk nz goverment so kind to the criminals they should punish them so hard so next time they dont do it. i think your judges are paid to protect criminals..it is high time for the people in new zealand to file charges againts any judge who should be held liable in eaqual measure should the criminal he/she released committed another crime ..what do you think?? this way judges will think twice before giving a violent criminal a parole..
Law makers and judges have failed in their duty to keep us safe. All the do-gooders and rehabilitation freaks have helped to get violent offenders out of prison and back on the street at the earliest possible opportunity to do this again… Please do not sleep well at night and hang your heads in shame. In a case a clear cut as this .. with the forensic and DNA linking evidence and technology available today. We should gladly impose the death penalty on offenders like this. It would not be a case of mistaken identity anymore but clear cut evidence which links the killer to the case. I despise the soft sentences imposed on these people and the fact so much of your hard earned tax money goes on keeping them eating and breathing in prison. We could provide 6 homes for the elderly or homeless for the cost to keep these people alive and imprisoned. A referendum for re-instatement of the death penalty should be considered after this. New Zealand has been given a “D” rating on a report card prepared by the New Zealand Institute, because of its high rates of violent deaths and child abuse. This page has been updated and will continue to be updated. Birkdale is not a “tight-knit community”. Its an area where there are lots of crims and doche bag wannna be gangsters. There is always some sort of disturbance going on in that area. I always hear sirens and see the police chopper over that area. I disagree. I live on Blessie’s road and know the full story of the accused offender. Our neighborhood is tight knit, we know all our immediate neighbors and several other people on the street. The police commented when they poppd round to ask what we’d seen/ heard the night Blessie died (we were out all evening) that they were surprised how kind and helpful everyone in the area is. One disgusting low life spent a few months in this suburb and committed a terrible deed, but don’t tar the whole neighborhood with that brush. I suspect your community is tight knit to the extent that you all gossip about each other. Aside from that, your community is as tight knit as North Korea is free. You undoubtedly think that your neighbourhood is comprised of the nicest people in the world and it is a safe place, but the facts obviously state otherwise. Renee, New Zealand must undoubtedly be the world’s safest country comprised exclusively of people with huge hearts according to you. It is a pity that the only people stupid and dishonest enough to believe the hype are stupid and arrogant cretins like you. Stupidity and dishonesty ultimately cost lives. My heart goes out to this woman and her family. This is another unnecessary and avoidable tragedy. Please tell me what your malfunction is. Renee made an incredibly stupid and thoughtless comment and I simply responded to it. Rather than spewing nonsense ad infinitum about coming together, why not demand some accountability from the New Zealand (in)justice system and a brutal culture that encourages kids to act like lowlifes. we have a system THAT IS BIASED TOWARDS THE OFFENDER AND LITTLE REGARD TO THE VICTIMS. put all the offenders released on bail somewhere remote like Christmas Island maybe?? but not back into a neighbourhood that has a loving mother, loving father, loving children living a healthy happy life in a peaceful atmosphere for goodness sakes…. Unfortunately Renee it is unsafe. Try entering this search string into your internet browser and see what you come up with, the results may shock you https://www.google.co.nz/#q=woman+attacked+site:co.nz. 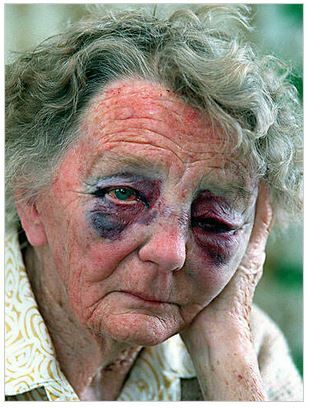 Open your eyes women are getting attacked all over the country…Palmerston North, Timaru, Hastings, Hamilton, Wellington, Blenheim, Auckland, Waihi, Runanga, Christchurch, Papakura … you live in a violent society, face the facts. Thank you for the link that is scary and gives us all reason to be less complacent. Would you want your mother walking home alone along Blesilda’s road? Think about why you wouldn’t and why so many re-offenders are released while they’re still a danger to the community (hint: high incarceration rates and prisons at over capacity). nz is too kind to criminals, in mindanao, people like this are be tortured by cutting the limbs, tongue, and taking out the eyeballs and letting him live so that somebody will think first before doing this heinous crime. Marc in New Zealand the victims’ families get ‘life’. The perps get a 14 years sentence in a centrally heated cell with a TV, reduced to 2/3 for good behaviour. This man is likely to be out stalking the streets again before he’s middle aged, meanwhile more like him will emulate his crime. Haha, true. You forgot to add a ‘playstation’ on the list of ‘five star’ amenities in NZ jail ,which costs on average, $90,977 to keep a prisoner in jail for a year! So basically taxpayers have to shell out their money to keep these scums alive. NZ jails are an ‘extreme’ luxury, compared to most other nations. While to many ‘intellectually inclined’ (prefix sham) NZers capital punishment may seem barbaric, so why not outsource NZ prison services following the ‘ingenious’ low cost model of Australia, who is housing refugees in PNG prisons. I believe, instead of these ‘genetically inferior’ idiots, such refugees should be give a chance, instead of these scums, because most of the refugees really need a helping hand and have an immense desire to succeed in life. As about the criminals of NZ, just because they are born in NZ, doesn’t make them any less of a criminal, so basically just ship them away to PNG, save some taxpayer bucks there!